After using several different paints on the market on other jobs, we analyzed the performance of each including the No-VOC ecologically friendly "green" paints. We chose American Tradition satin paint for Project Home. In other projects, after several years this American Tradition paint still has a strong vibrant appearance as opposed to the no-VOC paint that within a year is fragile, faded and in need of repainting. This lead us to conclude choosing some initial off-gassing is actually more "green" because the paint lasts longer, doesn't require redoing and eliminates the extra paint cans going to the landfill (as well as the embodied energy of bringing the cans across country to the store also lessons the carbon footprint of this project). American Tradition paint has minimal off-gassing and no ill effects were reported by anyone in the house during the time of painting (no headaches, allergies, sinus problems, etc). 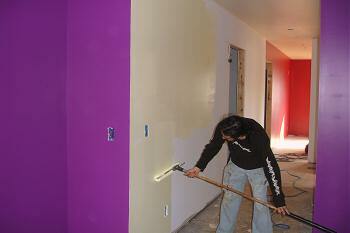 A couple of the crews reported this paint actually had less of a smell than some of the no-VOC paints. A few of the crewmembers suffer from asthma and reported no ill effects from working in the house. This is in comparison to the burn pits used outdoors to help warm the workers did cause an asthmatic problem. The paint crews, TJ Moody and Michael completed primer and a top coat. Sadly, a car accident prevented this crew from completing the job. We hired Luis Covarrubias with All Seasons Painting who did a fantastic job finishing the top coats of all colors in a weekend. The primer gave one coat finish. The paint gave excellent coverage - the dark colors requiring two topcoats and the light colors only one coat. Painters- TJ Moody & Michael - Primer and some top coat.